Space station commander Peggy Whitson and astronaut Jack Fischer are set for a two-and-a-half hour spacewalk Tuesday, a quickly-planned excursion to replace a recently installed external computer that failed Saturday. The 50-pound data relay box, known as a multiplexer-demultiplexer, or MDM, is one of two “tier 2” command and control computers mounted in the station’s power truss that route commands to a variety of critical systems and relay telemetry from them to the ground. 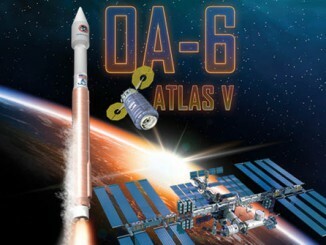 While the one operational tier 2 MDM can handle the full load, NASA managers opted to replace the failed box as soon as possible to restore full redundancy. And so, Whitson and Fischer will venture back outside just 11 days after completing their most recent excursion on May 12, switching their spacesuits to battery power around 8 a.m. EDT (1200 GMT) to officially kick off U.S. EVA-43. Whitson checked out a replacement MDM Sunday and she will install it by herself Tuesday, working on the front side of the station’s power truss. The box is about the size of a small microwave oven. While Whitson focuses on replacing the failed MDM, Fischer will mount two antennas on the Earth-facing side of the Destiny laboratory module to improve communications with spacewalkers. 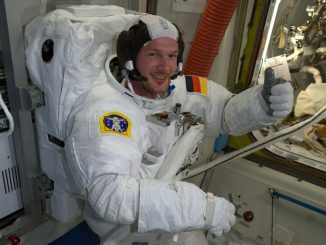 He originally planned to attach the antennas during the May 12 EVA, but the task was deferred when the spacewalk ended early because of airlock problems that delayed the start of the excursion. Despite its relatively short duration, the spacewalk will move Whitson even higher on the list of most experienced spacewalkers. She already is the world’s most experienced female spacewalker and ranks fifth in the world overall with 57 hours and 35 minutes of EVA time over nine excursions. She will move up to No. 4, moving past astronaut Jerry Ross, 20 minutes into Tuesday’s EVA and if all goes well, she’ll move past John Grunsfeld into the No. 3 spot 35 minutes later. Cosmonaut Anatoly Solovyev is the EVA world record holder with 78 hours and 21 minutes of spacewalk time over 16 outings. Retired NASA astronaut Mike Lopez-Alegria is No. 2 with 67 hours and 40 minutes over 10 spacewalks. The MDM that failed Saturday was installed by Whitson and astronaut Shane Kimbrough during a March 30 spacewalk. It was one of two new tier 2 avionics boxes loaded with upgraded software and circuitry, known as enhanced processor interface cards, or EPIC, to improve performance. The other MDM was installed March 24 during a spacewalk by Kimbrough and French astronaut Thomas Pesquet. It is not yet known what caused MDM-1 to fail Saturday, but engineers said an apparent hardware issue likely is to blame. The space station uses 44 MDM computers, connected in three “tiers,” to control virtually all aspects of the lab’s operation. The two recently installed EPIC MDMs are part of tier 2 in the command architecture and are one-fault tolerant, meaning the station can continue normal operations with just one of the computers. The tier 2 MDMs relay commands to a variety of critical station systems, including the station’s guidance, navigation and control system, the lab’s stabilizing gyros, the environmental control system, the station’s cooling system and others. 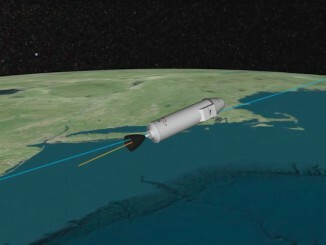 While the failure of MDM-1 had no immediate impact on station operations, NASA managers opted to replace it as soon as possible to restore full redundancy.